The best way of helping dyslexic children is to provide them with individual, one-on-one professional reading instruction aimed at reinforcing both whole-word identification and tic decoding skills. Additionall, a customized reading comprehension program, designed to meet the individual needs of every student! will guarantee the best results. The teaching of reading is a very complicated process that requires a great deal of knowledge and experience based on theories of learning. Most importantly, the instructors need to focus on the learning styles and strengths and weaknesses of each student. The strategies for the instruction of reading need to be designed by a trained expert like Dr. Larman in order for the lessons to be successful. 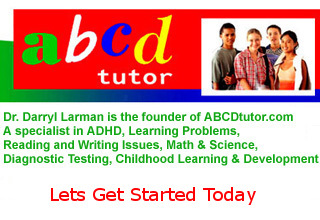 Dr. Larman uses a variety of reading approaches and methods that include the following theorists' approaches: Samuel Kirk, Newell Kephart, Raymond Barsch, Gerald Getman, Bryant Cratty, Alfred Strauss, Laura Lehtinen, Marianne Frostig, Valett, Piaget, Grace Frenald, Helmar Myklebust, William "B." Gearheart, Mildred McGinnis, Jannet Lerner, Samuel Orton, Charles Osgood, Anna Gillingham, William Cruickshank, Oliver Kolstoe, Lindamood-Bell, Siegfried Englemann, and Dr. Larman's Scientific Reading Method (SRM). Dr. Larman has not only studied and used the methods and materials of the above theorists, but he was a student of many of these famous educators. Dr. Larman is the grandson of the grandfathers of education. He developed the SRM after thirty years of research and hands-on psychoeducational testing and evaluations. Every student has individual differences, therefore, every child's reading program needs to be designed to meet specific individual needs. Dr. Larman's Scientific Reading Method (SRM) will amaze you. We guarantee it. Boynton Beach, Delray Beach, Boca Raton, Deerfield Beach, Hollywood, Aventura, South Palm Beach County, Broward County, North Dade County. "Most Outstanding Young Man in America"
along with Dr. Martin Luther King, Jr. and President John F. Kennedy.